Created for the classroom, the Technology Workstand 2005 is mobile and adaptable for a multitude of teaching situations. The Easy Rise piston feature lets educators adjust cart height with equipment attached. 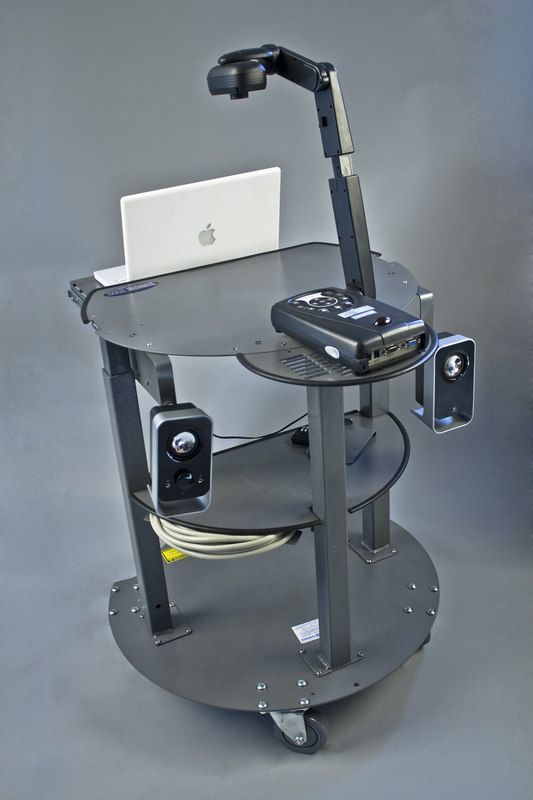 “SecurityWorks built the Workstand 2005 around the document camera and projector. Our designers wanted Technology Workstands to be modular, so one piece of equipment could be adapted to accommodate a wide range of educational technology equipment. SecurityWorks, Inc., a designer and manufacturer of IT accessories that allow mobility, security and ergonomics, announced today the introduction of its multimedia cart series, Technology Workstand 2000. Its newest edition, Technology Workstand 2005, is the first and only AV cart that provides secure and ergonomic mounting for all makes and models of portable document cameras, and is now available to order for $429. The educational member of the company’s Technology Workstand product family, Technology Workstand 2005, targets the needs of teachers in the classroom. By allowing secure mounting of any document camera, as well as a laptop computer on a height adjustable base with wheels, teachers are able to teach from the most optimal spaces in the classroom. 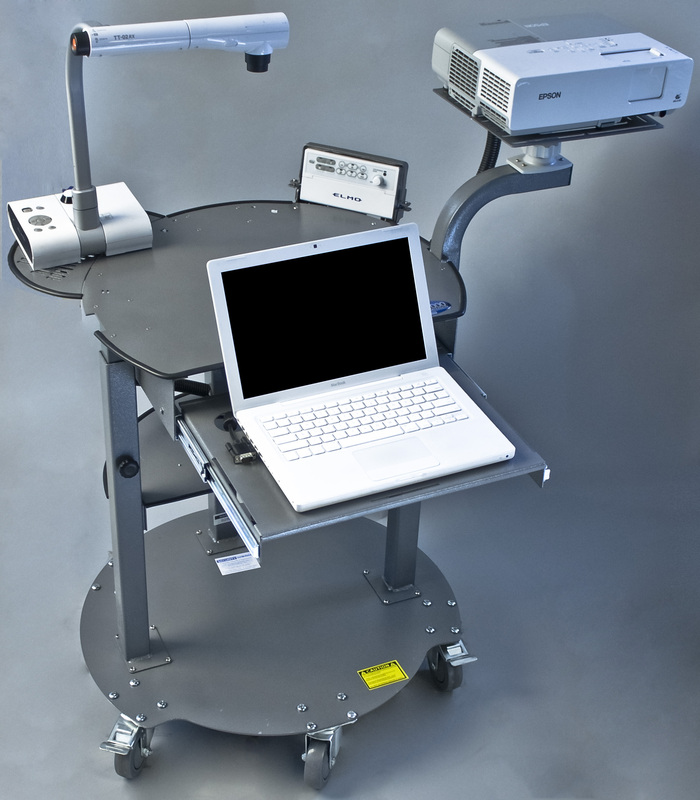 The patented Technology Workstand 2005 is the ultimate AV cart that provides security and mobility. It is constructed with all cold rolled steel, and finished with a hammer tone powder coat. The Workstand provides automatic height adjustment of work surface, with equipment installed, from 28” to 40”. It is equipped with five 4” durable, heavy-duty, steel-fork casters, two that lock. In addition, the Workstand has a circular foot rest plate that measures 25” in diameter. It also comes with a six outlet surge protector with 20’ cord to the wall. The power system comes as standard equipment with each Workstand and is mounted neatly on the underside of the Center Shelf. The laptop or tablet is housed inside a shelf on a pull-out drawer that locks with a resettable combination padlock. A cargo net, capable of holding TEs is located on the underside of the laptop drawer. The Workstand’s document camera mounting plate is designed to adapt to any make or model of document camera so the lens is centered on the work surface and the user interface faces the teacher within easy reach. The Workstand has a 23” diameter dedicated work surface, free of any equipment that would interfere with the use of the document camera. SecurityWorks offers a 12-year warranty on the Workstand, and 3-year warranty on the cylinder. SecurityWorks, Inc. also offers has a variety of optional accessories including: custom security cable to lock Workstand, dust cover, fitted dry erase board, and secure speaker mounts. The Technology Workstand 2000 is available through dealers and VARs across the country. Education pricing for the Technology Workstand 2005 is $429. To find your local dealer please contact Security Works, Inc. at 800-880-3988 ext. 301.